Offering free WiFi and an outdoor pool, BeGuest Tejo Luxus Apartment is set in Algés. Lisbon is 8 km from the property. Free private parking is available on site. The accommodation is fitted with a seating area. There is also a kitchen, fitted with a dishwasher. An oven and microwave are also featured, as well as a coffee machine. Every unit features a private bathroom with a bath, free toiletries, and a hairdryer. Bed linen is available. 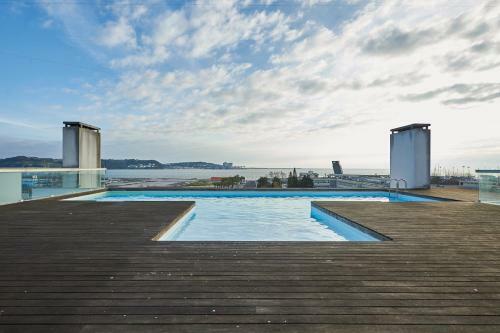 BeGuest Tejo Luxus Apartment also includes a sun terrace. Sintra is 18 km from BeGuest Tejo Luxus Apartment. Lisbon Humberto Delgado Airport is 12 km away. DPH ve výši 6 % je v ceně. Poplatek za úklid ve výši 45 € za pobyt není v ceně. Turistický poplatek ve výši 1 € na osobu za noc není v ceně.